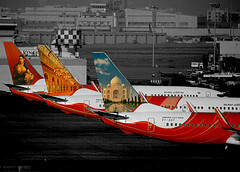 Airliners-India :: View topic - Is Surat the opportunity which airlines missed? Is Surat the opportunity which airlines missed? Posted: Tue May 16, 2017 10:18 am Post subject: Is Surat the opportunity which airlines missed? Estimates suggest that eight out of ten diamonds polished worldwide are cut in Surat. Some of the biggest names in Petrochemicals – Essar, Reliance, Shell, ONGC have business in neighboring Hazira which houses a deep-water LNG terminal and over a quarter of the total fabric production in the country is around Surat but the city with ninth largest population in the country has struggled to make its mark on the air map. As Low Cost Carrier Spicejet announces a spate of connections from Surat, is it time to look if Surat is the opportunity which airlines missed? Effective 1st June 2017, Spicejet will operate daily non-stop flights connecting Surat to Jaipur, Hyderabad and Goa operated by the Bombardier Q400 aircraft. A month later the airline will connect Surat to Kolkata and offer one-stop connections to Patna, the latest destination for the airline. The expansion is quick after re-instating services on Delhi – Surat from 26th March 2017. Online pressure groups have been petitioning airlines to start operations from Surat for close to a decade. The protests have been creative as well as funny to say the least. However, a mix of local pressure, political force and willingness from the airline to see the sheer size of the market seems to have come together to give Surat its wings to fly. Predictive analytics becomes difficult due to lack of past data. It then boils down to which airline has the risk appetite to go by empirical estimates and it was Spicejet. The airline, however, won’t have a large exposure. B737 operations comprise 3.6% of total Boeing operations and the flights to be operated by Q400 will form a little over 4% of total Q400 operations by the airline. Posted: Mon May 22, 2017 10:45 am Post subject: Re: Is Surat the opportunity which airlines missed? Sir, once again, a lovely analysis, kept a bit light for a wider audience. Very nice background-building, and informative analysis. All of this managed beautifully into different sections, each highlighting a different facet of the issues at hand. AI is not doing badly at STV, with good numbers, and relatively fair yields. STV has come a logn way from the few-times-a-week CR7 ops by Air India Regional, which often saw cancellations owing to poor loads, and excellent train connectivity (which continues to date). The air traffic has grown by leaps and bounds. You had told me about the Ventura Air Connect shift of operations as well. SG's venture is interesting: CCU is understandable given the history, but not good in terms of yields, unlike PAT. The last para is a loaded one. I look forward to reading more from you, on this! As and when things develop, with time. Thank you sir. Even I am eager to see how international operations from STV sustain as and when they start. Fast forward to Dec 2018. Surat has now become a busy airport, with flights to dozen +cities within India. May be international soon.